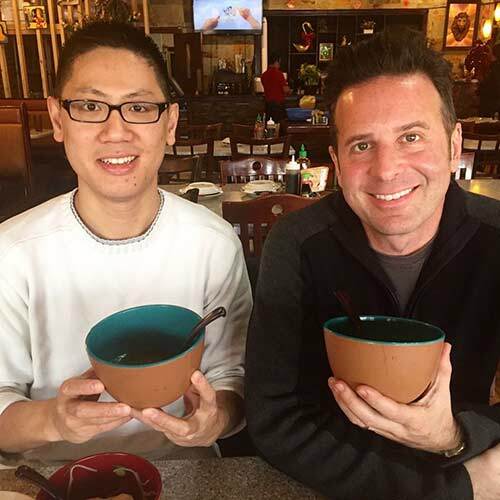 CHICAGO (WLS) -- In the middle of winter, several bowls vie for your attention. In Chicago - home to the largest Polish enclave outside of Warsaw - borscht and bigos (hunter's stew) are a given. But our melting pot culture, and patchwork of 77 distinctive neighborhoods, also means you can indulge your memories of that backpacking trip to Chiang Mai with a coconut milk-rich khao soi, or sit at one of several austere wooden counters for a steaming bowl of tonkotsu ramen, embedded with all manner of fish cake, chewy bamboo and crisp sheets of nori. Shaw's still serves a damn fine bowl of New England-style chowda, and I've found myself on more than one occasion in Marquette Park, tucking into a bowl of the finest chili at Lindy's Gertie's while simultaneously planning to meet friends in Chinatown for a boisterous hot pot session later that night. But more often than not, I seem to always return to pho. Perhaps because my son has always been enamored with its primal beefy qualities, or maybe because the broth - and inherent steam - taps into some visceral pleasure center (I wouldn't be surprised if some entrepreneurial spa owner started marketing a pho facial one of these days). In any case, the Vietnamese staple has become the de facto calling card and edible ambassador for nearly every restaurant along Argyle Street, in Uptown. The namesake at Pho #1 on the NW Side. Pronounced "fuh," the ubiquitous soup usually arrives in a large, wide-mouthed white bowl, large enough to hold a personal pizza (about 9" to 10" across). At its base, a mound of briefly-cooked, flat rice stick noodles (not vermicelli, which are served dry with things like egg rolls and fish sauce); they're a little smaller than a pad thai noodle, completely white and a tad more delicate, since they are made from rice, rather than egg or flour. On top of the boiled noodles, you must choose which type of beef you'd like (or not): slices of fatty, tender brisket, hunks of chewy tendon, alien-looking shards of tripe, paper-thin slices of eye of round (typically raw), maybe some meatballs; if the place is truly special, perhaps a hunk of cooked oxtail for added richness. A handful of white onions and scallions, possibly with some chopped fresh cilantro, gets scattered over this beefy fortification, and then comes the most exciting part: the heady broth. Ladled into the bowl, the heat instantly cooks the raw slices of beef and servers typically whisk the bowl out to your table immediately, where a condiment plate has been standing sentinel, housing some fresh lime wedges, a few jalapeño rings, a tiny mound of fresh bean sprouts and a few sprigs of Thai basil; if you're lucky, maybe they've splurged on some wonderfully aromatic culantro (also known as sawtooth mint), not to be confused with cilantro. I'm always puzzled as to why people toss the entire kitchen sink into the bowl. It's o.k. to add some of the condiments to enhance the flavor and provide texture (although if you're going to use the fresh lime, go ahead and squeeze it - no need to toss the entire wedge in there; it's not a mojito). But the true crime occurs whenever you see those poor souls squeezing bottles of sriracha and hoisin directly into the broth. If the broth is delicious, it should be able to hold its own without additional heat and sweetness. Dumping in those sauces implies the broth is lacking, or has some odd taste that needs to be covered up, like shmearing eggs, onions and capers all over an inferior caviar. When you consider how much effort has gone into creating that soup, adding extra sauce just seems impolite. In case you're wondering what the sriracha and hoisin are for, ask for a tiny side saucer and squeeze a bit of each into it (I call it the "yin yang" dish). If you feel like dipping some of the beef into it for added flavor, once you remove them from the bowl, go right ahead. 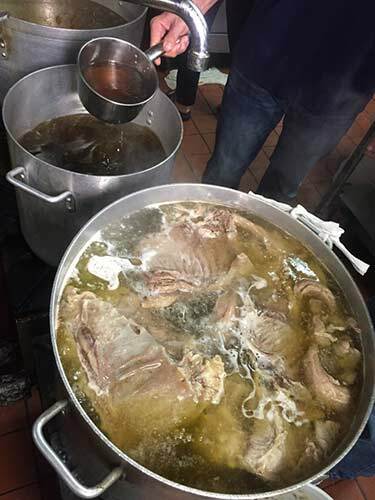 Pho broth is typically made in enormous stockpots, over the course of many hours, but the thing that makes this beef broth truly unique is the aromatics. Of course there are bones aplenty buried beneath the surface, which will eventually express their marrow, but also a sachet or filter, holding cloves, star anise, black pepper and ginger. I've also seen some places rely on shallots, beef bouillon and leeks. Ramen typically gets a hard boil for up to 18 hours for tonkotsu, or pork bone broth, thus turning the soup a milky white from all of that collagen and marrow that are released from the pork bones. The boiling is so vigorous, in fact, that many ramen shops have a tiny spigot positioned directly above the pots, which allows for a slow drip of water. The stock may be concentrating its flavor, but it's also evaporating. That gentle drip replaces whatever is evaporated, so that after 18 hours, the stockpot isn't half-full. Pho, however, rides along on more of a simmer, for anywhere from six to 14 hours. Cooks constantly strain the surface, removing impurities, looking for an almost caramel-colored liquid that eventually breathes and expresses itself in two worlds - the heartiness of beef alongside the ambrosial delicacy of the aromatics. 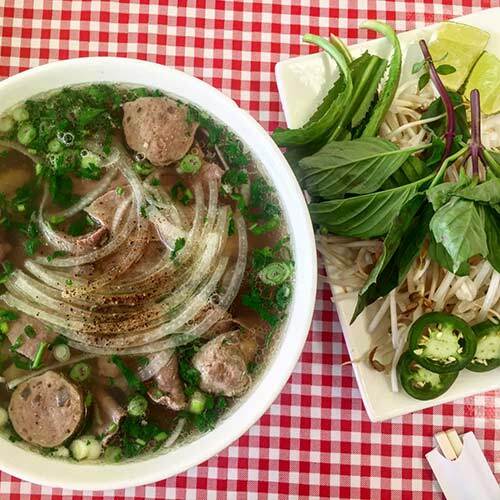 There have been a few attempts in Chicago to rank all of the various pho options. It's not an easy task. Like my Italian Beef Quest and last year's Pizza Quest, the commitment after #10 and #11 usually becomes much harder than you imagine when you first start out. "Oh hey, I love eating pho!" say my friends. "I'll join you on that #ChicagoPhoCrawl, sounds fun," they text me. But after two weeks of eating nothing but pho, with the prospect of heading out on yet another weekend to try six or seven more bowls, the amateurs quickly drop off. People have lives, I guess. The reason I started this quest was based on an email I received from Paul Nguyen. Paul is a grad student at Northwestern University, completing dual MBA and Masters in Design Innovation degrees (I know, real underachiever). He's also first generation Vietnamese originally from Harrisburg, PA, and had reached out to me on my website, asking me what the criteria was for my last Top 5 Pho story I did exactly two years ago. "I don't really remember," I told him. "I think I hit about 10 places, scored them for aroma, taste and presentation, then came up with my top 5." Paul suggested we cover more than that, using some statistical analysis as our guide. I insisted we hit every place in Chicago where pho plays a significant role on the menu. Paul would not only lend his expertise (his childhood was filled with pho memories, many times based on actual home-cooking, as opposed to my relatively late-in-life epiphany of seeking it out in restaurants), he would also become our Nate Silver, helping to score, rank and determine who truly, once-and-for-all, serves the best bowl of pho with the best condiment plate. Like my #ItalianBeefCrawl and #PizzaQuest, we had to have some ground rules, and set a standard baseline by which we'd order. Italian Beefs were always ordered "sweet, hot, juicy." Pizzas were ordered half pepperoni, half sausage. For the #ChicagoPhoCrawl, we ordered a bowl of pho dac biet (the house special pho) which would allow the restaurant to show its best stuff; these were bowls filled with their homemade brisket, meatballs and eye of round, and sometimes, if we were lucky, a wedge of oxtail or a silken hunk of tendon, rendered completely flaccid from multiple hours getting pummeled in a stock pot. The condiment plate would sit, untouched, so that we could taste the pho on its own merits, but we'd note what it came with, how those bean sprouts looked, and how generous they were with the Thai basil, noting if it was fresh or splotched black; extra points went to places that included a bit of culantro (saw tooth leaf) which has a haunting aroma all itself. We wanted to try the dac biet as much as possible, to sample the bowl with the largest assortment at each restaurant. However, we scored based on the quality of what was presented, as opposed to the variety. In other words, a restaurant received no advantage or disadvantage in scoring because it served more or fewer meats. We did this because we recognize everyone has different tastes - not everyone will like all of the different cuts of meat, and I know for a fact that tendon, tripe and oxtail might be a reach for some diners. Thus, our scores/ratings represent a general indicator of the quality they can expect, regardless of which meat cuts they ultimately order. The side garnishes score worked differently however, because it is reasonable to expect to have all of the garnishes served, and restaurants that served all of them received a higher score accordingly. Step 1: Score the restaurant's pho on a scale of 0 to 5 in each of 4 categories: smell, presentation, taste, and the side garnishes presented. For each category, we had a list of criteria that we checked off to determine what score was earned. For example, we were looking for thinly-sliced eye of round, just barely cooked from the hot liquid, still a little rosy in the center and certainly not overcooked. We were hoping to taste soft, fatty brisket, meltingly tender tendon and firm tripe; meatballs should be homemade (although not everyone does this and it's hard to tell unless you ask) - they're typically embedded with tiny bits of tendon, and the broth enveloping it all should have a layer of tiny fat droplets scattered across the top, indicating pockets of flavor, but should also be relatively clear and not cloudy, like dirty bath water. Heat is essential, often making enough of a difference in the taste such that a steaming bowl usually beat out a listless one, no matter how good the stock was. Again, we never added any sriracha, hoisin, or anything else so we could taste the pho on its own merits. Step 2: Review scoring across restaurants and make few and small adjustments where necessary to ensure fairness and consistency. As you can imagine, it's not easy scoring so many places but we were careful to give credit where credit was due. At each restaurant, we took a photo of the pho and the side garnishes and also detailed notes in each category so we could go back to cross-reference them. Step 3: Apply weighting to the score in each of the 4 categories and then add them all up to yield an overall score for each restaurant. Taste had the heaviest weighting, followed by presentation, smell, and finally side garnishes with the least weight. We also evaluated the restaurants on other things like the restaurant's atmosphere, service, cleanliness, menu options, and value for the price. While we collected this information, these categories were NOT used in ranking the restaurants as the ranking is focused purely on the merits of the pho itself. We did this to ensure we didn't "throw the baby out with the bath water" when perhaps the atmosphere or the service wasn't so good but the pho was incredible. You can see the range of overall scores in the graph below. The worst pho scored a 22.50 while the best pho scored a whopping 49.40 (that's almost a perfect score of 50). The average score was 36.21 with a standard deviation of 7.45 and a median of 36.25. We made note of the prices for the pho at each restaurant and encountered a wide range of prices. The lowest price was $7.69 while the most expensive pho would set you back a hefty $16. The average price was $9.87 with a standard deviation of $1.69 and a median price of $9.75. Out of curiosity, we regressed the overall scores on the prices to understand what, if any, relationship there is between the price of a bowl and the overall score. 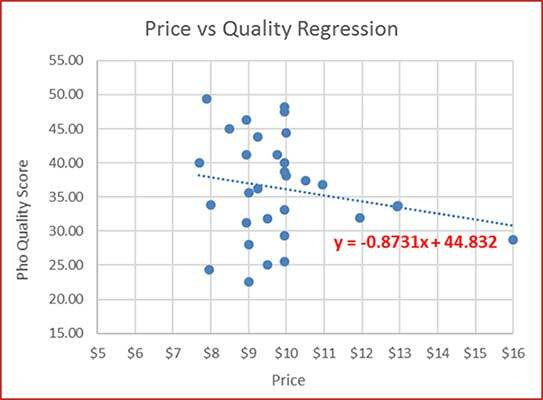 From the scatterplot graph of the regression below, it would seem that the overall score of the pho dropped as the price increased. However, the p-value for the coefficient of price in the regression was too high which means there is no significant relationship between the price of a bowl and the overall score. In plain English, this simply means that the price of a bowl has no bearing on the quality of the pho. So while the saying often goes "you get what you pay for," our data suggests this is a situation where that might not necessarily hold true - paying more does not necessarily mean getting better pho. 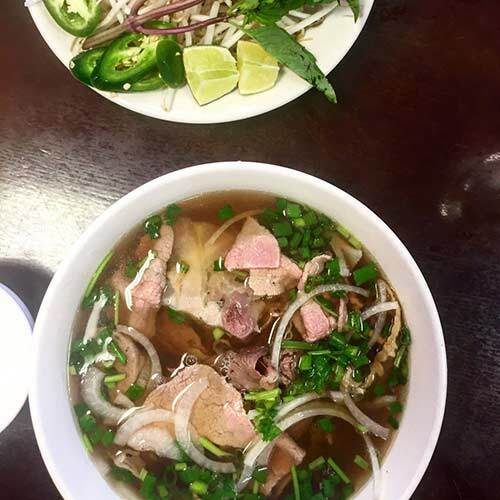 We also noticed that some of the more well-known restaurants were typically the ones to charge more and we would extend a word of caution that you might not only find yourself disappointed with the pho at these locations, but also be all the more poorer for it. I wanted to add one more important thing. One of the biggest issues we ran into was heat. Or lack thereof. Despite the many hours most of these restaurants commit to making a deeply satisfying, intensely aromatic broth, they whiffed on serving it at the proper temperature. More often than not, the bowls would arrive barely steaming; the ones that did couldn't very well be classified as "hot" but rather, "really warm" and within two minutes were tepid at best. One that stood out for me was Pho Lily in Uptown. The flavor of the broth and the quality of the meat should have easily landed them in the top 10, but since the bowl was barely warm enough when it landed on our table, their score plummeted. Shame. On Wednesday, January 4, we'll share with you our #11 - #31 picks. Thursday, January 5, we'll release #6 - #10. On Friday, January 6, we'll announce our Top 5; that day at 11:50 a.m., I'll feature the Top 3 on ABC 7 News (which will repeat at 6:15 a.m. on Jan. 8). At 12 p.m. Friday, I'll be doing a Facebook Live with Paul, recapping our Top 10 pho. And on Jan. 6, 7 and 8 I'm guessing a lot of pho restaurants are going to be busy in Chicago. Hope you enjoy this ride as much as we did.